Many of you that have been on one of our poultry keeping courses will already know about these two super products - Coop Care - dry disintfectant for inside poultry coops & Poultry Care - ground disinfectant for outside poultry coops to keep the ground sanitised. We have been using these two products for a number of years and can thoroughly recommend both products. Since using these disinfectants we have not had ONE case of whole batch death in chicks due to coccidiosis. These products are one of our 'CAN'T LIVE WITHOUT' products. The products are made by Bolshaw Animal Health and are ecologically and environmentally friendly. Dried droppings and other waste treated with these products can be added directly to garden compost to improve quality. Bolshaws has been serving the UK agricultural industry for many years. With a background in farming they are passionate and highly committed to ensure their products are continually effective in maintaining high levels of animal health. 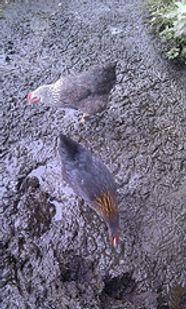 ltry care is an easy to apply ground disinfectant for use in poultry runs outside the coop where droppings build up and contamination is most likely. Spreading Poultry Care will have an immediate effect on the potentially harmful bacteria that thrive in this environment. Poultry Care maintains a sterile alkaline enriovnment in excess of pH12 for sustained periods. The reaction of Poultry Care with water create a sudden temperatutre rise to over 70 degrees that destroys all but the most thermally resistant organisms. During this reaction Poultry Care absorbs the water from the treated area to create a more stable and sanitary environment. Poultry Care also kills off the biological organisms that cause odours and prevent sfermentation of the effluent. What is it effective against? Wait until birds have gone to bed - or remove from the area whilst ground is treated. 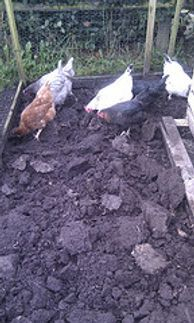 Leave Poultry Care on ground untouched over night - or for at least 4 hours. Birds can then be let back in to the treated area or leave over night and let them out in the morning. A little bit of work turn over the top soil to improve drainage. Put the kettle on - let the poultry care do the work and your birds can be let out the next day safe in the knowledge that their environment is sanitised. We often will add a fresh layer of wood chippings onto the ground the following day to make it all look lovely again. Coop Care - Disinfectant for Inside the coop or rearing sheds. also reduce the number of flies in the coop - a well known source of poultry infection. 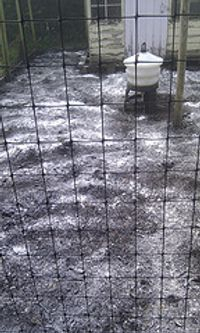 Sprinkle on the base of the poultry coop - so that the coop floor is lightly covered. Birds can immediately be returned to the poultry coop - no need for them to be kept off the area.dd fresh bedding on top of coop care - no need to sweep out. With both of these products sensible precautions should be taken.